The Goji berries that grow wild in the valley are thought to come from Chinese market gardens, possibly as early as the 1880s. 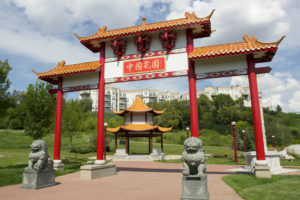 Edmonton’s river valley was once dotted with market gardens, many of them operated by Chinese families. These gardens supplied Chinese restaurants, Edmonton’s Woodward’s Store, and even distributors like McDonald’s Consolidated. They were a well-known presence in the 1930s and ’40s, remaining until the ‘60s, before they began to disappear as employment opportunities increased for the Chinese community. Gradually the city converted the river valley to mainly recreational uses. Today the Edmonton Chinese Garden Society and the City are creating this authentic Chinese garden with local architect Francis Ng. Its design is a combination of traditional architectural and horticultural elements adapted for Edmonton’s winters and short growing season. The twin stone lions were a gift from the People’s Republic of China.